Spots for this class are filling up fast. Less than 10 spots remaining. As we move into February, spring break is right around the corner, and many teachers are starting to think about their summer plans. I was a high school physics and math teacher for five years, and I remember the feeling of hitting a stride in February when my lesson plans were prepped and ready a full week in advance, homework was all graded, and my classroom ran like a machine! With a little more time on my hands, I often thought about my teaching and what I could do to make learning better and more effective for my students. This led me to think about what professional development classes I could find for the summer. Don't get me wrong; I also looked forward to sleeping in, relaxing and not grading during the summer. But it was still a time to reset my teaching and my curriculum. Since I started here at SparkFun, I've had the great privilege and honor to teach and facilitate a course we call Microcontrollers for Educators (Micro4Ed) each summer that focuses on providing a foundation in maker education with a focus on electronics, programming and computer science. My first summer with SparkFun, I led a three-day Micro4Ed workshop with our friends at Bollman Technical Education Center. It was in the summer of 2013, and we were sharing their facility with their summer school programs. The only available room was the nursing room, so we made due with the gurneys and “patients” in the back! As a former teacher, I'm all too familiar with needing to be flexible and making things work. We brought in laptops, power strips, and a few soldering irons to reconfigure part of the room to be our own makerspace classroom. Over the past four years, the Micro4Ed course has grown and changed a lot. In our trainings, teachers continually tell us that they wish we just had one more day together. So a few years ago, we decided to extend the course to five days. With a full week together, we have the opportunity to stretch concepts out a little longer. We have time for teachers to see a new concept, think about it, struggle with it on their own and come back with questions the next day – much the same way our own students learn! The full week is really what it takes for teachers to be able to learn something new, think about it, try it out, sleep on it, reflect on it and repeat this process several times. It's this process that really helps solidify the learning and gives teachers the confidence to teach these materials to their own classes in the fall. With the new five-day course format, we are seeing and hearing more and more success stories in the classroom. More student projects are coming out of this, and teachers are feeling far more successful in their professions. 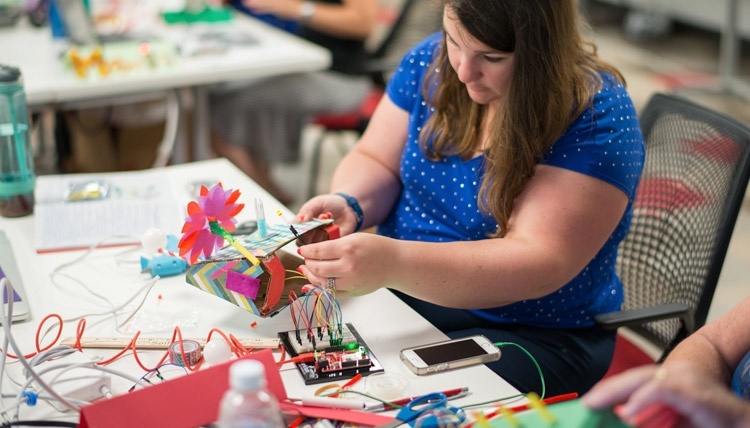 Teachers will be able to implement a maker-centric classroom built around project-based-learning (PBL). Teachers will understand the basics behind electricity and circuits, as well as how to teach these topics. Teachers will have a general fluency and literacy with programming concepts used in physical computing. Collectively, we will develop a set of lesson plans, activities and projects to use in our classroom that integrate microcontrollers, programming and electronics. You can see the full syllabus online. Because we know that many people will be coming from out of town, we plan a fun after-hours event each night. Boulder, Colorado, is a beautiful place, and we are happy to show you around. On the fourth night, we challenge teachers to play the role of their own students and work together in an Open-Hack/Hack-a-thon challenge combining the skills, concepts and circuits learned throughout the week to build and innovate something new and creative that they can use in their school. 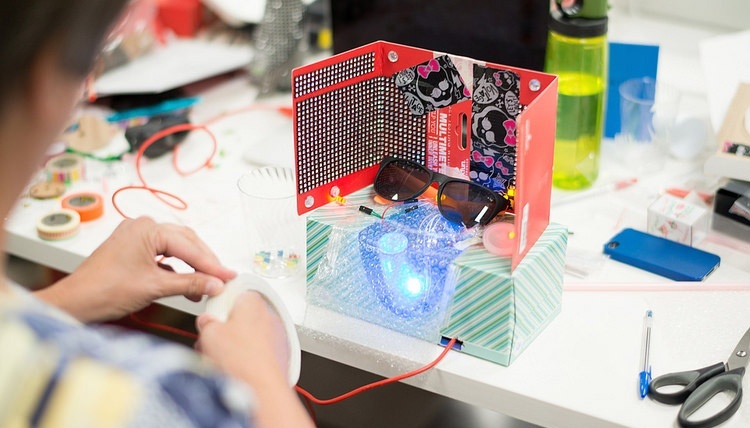 * Discussion/Activity: Maker Movement in Education/Why Computing? Intro to the “Tiny” Inventor’s Kit with ATTiny85: Same Concepts, Smaller Package! We hope that you will join us this summer. We are also considering extending a few other dates and potential remote locations away from Colorado. If you’re interested in finding out more, please post a comment below. I'd be remiss if I didn't also recommend Gary Stager's and Sylvia Martinez's Constructing Modern Knowledge Summer Institute. They are the authors behind Invent to Learn, and they run their own training the week before ours in Manchester, NH centered around building creativity, collaboration, and computing into the classroom. Check out a short photo album of the class from last year. You can see some of the awesome projects that teachers make during the week where we really integrate crafting, coding and computing!